I’m so excited to bring you guys an interview with Michael Panush, the author of the awesome Dinosaur Jazz! Sum up Dinosaur Jazz in a sentence. A Jazz Age adventure in a lost world. Apart from dinosaurs, what other research went into creating Dinosaur Jazz? Because Dinosaur Jazz takes place in the 1920s, I spent a lot of time researching the history and culture of that era. Luckily, I’m already a pretty big fan of the Twenties. I love the corruption, changing culture, crime, decadence and fedoras. I did my best to work a lot of history into Dinosaur Jazz’s fictional setting, the lost world of Acheron Island. I took elements from all over history, in order to create a unique world for Acheron Island that was still relatable. The island itself is a bit like Cuba in the Twenties – a corruption-fueled vacation spot for wealthy tourists to avoid Prohibition’s ban on alcohol. Acheron Island is also located in the Pacific, near Asia, so it was important for me to learn about China’s civil war, and the status of heavily-colonized cities like Shanghai. I ended up discovering a lot of fantastic characters from the Twenties and putting fictional counterparts of them in the book. For instance, one of the story’s villains is Lord Ruthven Ironside, a British World War One veteran turned insane Mongolian warlord. He’s based on a real person, the Baron Roman Ungern Von Sternberg¸ who was a deranged Russian war criminal who made his way to Mongolia and declared himself the resurrected Genghis Kahn. History is full of crazy stuff like that, which nobody could ever make up. I know I’m not alone in saying there was a point in my life when I lived and breathed dinosaurs and had dreamed of one day becoming a paleontologist. Did you have similar childhood aspirations? Definitely. When I was very little, I’d have tons of plastic dinosaurs cluttering up the house. My parents would read to me from books about dinosaurs and I remember pointing to a big sort of crowd scene in the opening of the picture book and demand to hear stories about all of them. I think all children – and all people – have this kind of amazement around dinosaurs and prehistoric creatures. They are just as fantastic as any mythical monster, but they actually existed. As I grew older, I still enjoyed dinosaurs – I remember enjoying the Dinotopia books a lot – though I don’t know if I ever wanted to be a paleontologist. I think there’d be too much math involved for me! I did take a class on dinosaurs and life science for college credit, which was great and certainly gave me an update on what dinosaurs actually were. Since then, I don’t think my interest has ever faded. Are there any particular authors and/or novels that have influenced your writing? For Dinosaur Jazz, I was influenced a lot by the pulp writers of the 1920s and 30s. HP Lovecraft has always been a favorite of mine, but I definitely leaned more towards the pulp action of Robert E. Howard. He’s most famous for creating Conan the Barbarian, but Howard also did a whole bunch of historical adventures and he can write action like nobody else. The Lost World stories of Edgar Rice Burroughs (creator of Tarzan and John Carter) were also a big influence on Dinosaur Jazz. The matter-of-fact way he relates the fantastic is incredible. For current authors, I tend to gravitate to sparser, crime writers like James Ellroy and Elmore Lenoard. Hopefully, you can see the influence of them when I bring on the rapid action scenes. What are some similar novels fans of Dinosaur Jazz should read next? That’s kind of a tough question, because not many authors tackle a pulpy Lost World story with modern sensibilities. I would definitely suggest reading some of the great adventure literature of the 1920s. For crime, there’s Dashiell Hammett’s Red Harvest, which I think is one of the greatest crime stories of all time. Novels about dinosaurs are also a little difficult to find, which I think is quite surprising. There are the obvious classics of course – The Lost World, Jurassic Park and so on – but my favorite bit of dinosaur-related fiction has to be L. Sprague de Camp’s short story ‘A Gun for a Dinosaur.’ Look that one up and you won’t be disappointed. Those should definitely give you a good overview of the world of Dinosaur Jazz. What books are on your nightstand/what are you currently reading? I just finished Donald Westlake’s Why Me, which is part of his comedic crime Dortmunder series. It was fantastic. I just started reading the next in Michael Moorcock’s Elric series, which is this great, New Wave sword and sorcery fantasy. The sheer imagination that Moorcock has for creating monsters, landscapes and magic is amazing. If you could read a book again for the first time, which book would it be and why? Probably James Ellroy’s LA Confidential. I was lucky enough to read it before seeing the movie, so all the twists and plot developments were completely surprising. That was also the first Ellroy book I’ve ever read and I just got wrapped up in this seedy, sleazy and seductive world of 1950s LA that he created. Reading that again would be an awesome experience. I’ve been a student at UC Santa Cruz for the past two years, so a lot of my time has been spent writing essays and going to class. Thanks to my roommate, I’ve also become a bit of a film buff. Do you have a specific writing routine? Is there a must-have snack or a certain type of music you need to listen to? I don’t know about a certain snack, but I do create little musical playlists for each book I’m working on, to help get me in the mood. The Dinosaur Jazz ‘soundtrack’ included the soundtracks to Boardwalk Empire and The Artist, some Squirrel Nut Zippers, Big Bad Voodoo Daddy, and The Pogues. That definitely helped me set the stage for some Jazz Age action. I also like to have an internet connection so I can do some quick research, but that’s pretty optional. Other that, I can really write whenever and wherever. 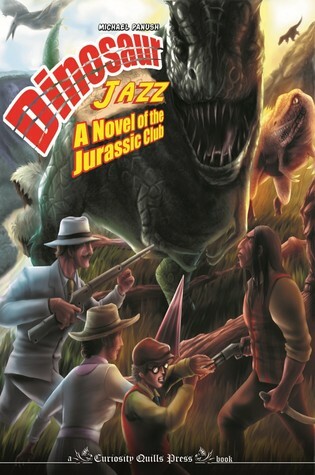 Dinosaur Jazz is the first book in the Jurassic Club series. What can readers look forward to in the next book? Do you have plans for any other books? I certainly do! I’ve written several short stories about Sir Edwin’s other adventures on Acheron Island, as well as stories taking place throughout the island’s history. Some of these stories include things like Scopes Monkey Trial-era Christian Fundamentalists, a Ninja Clan and Teddy Roosevelt visiting Acheron Island. I’m also nearly done with the sequel, Dinosaur Dust. That one takes place in the 1930s and features a Depression Era outlaw coming to Acheron Island, as well as crazed Nazis. I’ve got the history of Acheron Island planned out all the way to the present, with details about WWII, the Cold War, the turbulent 60s and 70s and Vietnam, the end of colonialism and the modern age. There are countless stories to be told about Acheron and I hope readers will stick around to hear them! A HUGE thank-you to Michael for taking the time to deal with me – lol and my delays due to an illness. Check out Dinosaur Jazz, guys. & check out Michael’s other stuff. He’s a fantastic writer and truly one to keep an eye on. Summary: Acheron Island is a world lost to time, home to prehistoric creatures from earth’s savage past. But now Acheron Island has some new residents – ruthless American businessman Selwyn Slade and an army of corporate cronies. Why has Slade brought all of his modern industrial power to conquer this world from the past? Can Sir Edwin uncover his strange purpose and protect this prehistoric world? Sir Edwin’s only allies are his stalwart Ape Man partner, a beautiful torch singer with a mysterious agenda, his strong-willed sister and her archaeologist boyfriend, and a family of American tourists – and they’re about to become the last hope of a lost world. It’s Jazz Age meets the Mesozoic Age in a world where cave men, gangsters, hunters, zeppelins, pirates, warlords and dinosaurs clash for a chance of survival. All that and more is waiting for you in Dinosaur Jazz, a tale of high adventure in a prehistoric world. Beyond Nathan’s naivety and clumsiness, a gentleman adventurer would not be a suitable career for anyone. There was no future in it. Men like Richard Francis Burton, Henry Morton Stanley and my own father had been the great heroes of a previous age, one that had vanished with the advent of the radio, the automobile, and the airplane – and with the horrors of the World War. I remain, of course – one of the last of the gentleman adventurer in a changing world. There are a few keywords that are my automatic “omg I NEED to read this!” words. Dinosaurs, the Jazz Age (or anything pertaining to Gatsby), and anything alluding to steampunk. Dinosaur Jazz has all three in spades. Acheron Island is something of a lost world. Sir Edwin Crowe’s father discovered the island and made both a name for himself and a nice chunk of change. However, he made more than a few poor financial decisions and now, instead of carrying on his father’s legacy, Edwin has to resort to being a tour guide in order to make ends meet. If Colonel Griffin found James and me being gobbled down by a tyrannosaur, I doubt he’d do much more than pass the beast some Worchester sauce to improve our taste. Things are going well until the arrival of the American Selwyn Slade and his shady company Titan Amalgamated. Add in a rogue band of cossacks along with a young archaeologist seeking his sister’s hand in marriage and it’s easy to see Sir Edwin certainly has his hands full. “Edwin, don’t do anything stupid!” Clara added. It was a fair bit of advice. I had to begin preparations for the party. After all, rifles, prey and hunting were simple subjects. Stalking a sure-footed astrodon through the swamps of the Lethe River was easy enough. But attending this kind of formal affair may prove quite challenging indeed. While there is a fair amount of violence, Dinosaur Jazz is an awesome book that will be sure to please readers. Also, it has dinosaurs.